Benjamin Stoddert (1744 – December 18, 1813) was the first United States Secretary of the Navy from May 1, 1798, to March 31, 1801. Benjamin Williams Crowninshield (December 27, 1772 – February 3, 1851) served as the United States Secretary of the Navy between 1815 and 1818, during the administrations of Presidents James Madison and James Monroe. Charles Francis "Deacon" Adams III (August 2, 1866 – June 10, 1954) was an American politician. He was a member of the prominent American Adams family, was the United States Secretary of the Navy under President Herbert Hoover and a well-known yachtsman. David Henshaw (April 2, 1791 – November 11, 1852) was the 14th United States Secretary of the Navy. Henshaw was born in Leicester, Massachusetts in 1791 and educated at Leicester Academy. Trained as a druggist, he achieved notable success in that field, then expanded his energies into banking, transportation and politics. He was elected to the Massachusetts Senate in 1826 and served as Collector of the Port of Boston from the late 1820s until 1838. Though he suffered business reverses during the later 1830s, Henshaw regained his political position as a leader of the Massachusetts Democratic Party within a few years. In July 1843, President John Tyler selected Henshaw as Secretary of the Navy. 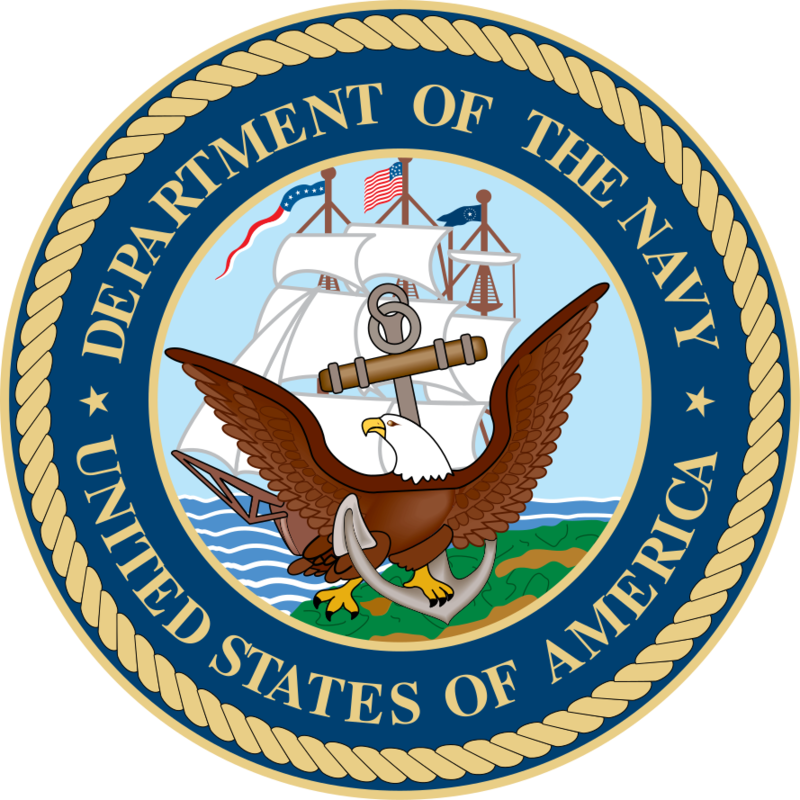 During his brief term in office, he addressed shipbuilding problems, selected senior officers for important seagoing commands, revised supply arrangements in the Navy Yards and attempted to establish a school for Midshipmen. His recess appointment as Secretary failed to receive Congressional confirmation, requiring that he leave office when his successor was confirmed. Henshaw then returned to Massachusetts politics. He died in 1852. USS Henshaw (DD-278) was named in his honor. Edward Hidalgo (born Eduardo Hidalgo; October 12, 1912 – January 21, 1995) served as the United States Secretary of the Navy in the Carter administration from October 24, 1979 to January 20, 1981. He had previously served as Assistant Secretary of the Navy (Manpower and Reserve Affairs) from April 1977 to October 1979. George von Lengerke Meyer (June 24, 1858 – March 9, 1918) was a Massachusetts businessman and politician who served in the Massachusetts House of Representatives, as United States ambassador to Italy and Russia, as United States Postmaster General from 1907 to 1909 during the administration of President Theodore Roosevelt and United States Secretary of the Navy from 1909 to 1913 during the administration of President William Howard Taft. James Cochran Dobbin (January 17, 1814 – August 4, 1857) was a nineteenth-century politician and lawyer who served as United States Secretary of the Navy from 1853 to 1857. Born in Fayetteville, North Carolina in 1814, the grandson of congressman James Cochran, Dobbin attended Fayetteville Academy and the William Bingham School and later went on to graduate from the University of North Carolina in 1832. While at Carolina, Dobbin distinguished himself as a member of Philanthropic Assembly. He studied law and was admitted to the bar in 1835, commencing practice in Fayetteville. Dobbin later got involved in politics and was elected a Democrat to the twenty-ninth congress, serving from 1845 to 1847. He later served in the North Carolina House of Commons in 1848, 1850 and 1852, also serving as speaker of the house in 1850. In 1852, he was a delegate to the Democratic National Convention where he helped secure the nomination of dark horse candidate Franklin Pierce for the presidency. Pierce appointed Dobbin United States Secretary of the Navy as a reward for his work in the presidential campaign. A firm believer in a strong Navy as an insurance for peace, Dobbin instituted reforms throughout the Navy. Eighteen of the finest ships of their class in the world were built during his tenure as Navy secretary. Under his auspices, the Perry expedition to Japan was carried to a successful termination and the treaty with that country signed. He ordered U.S. Navy Lieutenant Isaac Strain to command a U.S. Darién Exploring Expedition to map and survey the Darién Gap for a Panama Canal to link the Atlantic and Pacific Oceans. After his term as Navy secretary expired in 1857, Dobbin returned to Fayetteville where later that year he would die; he was interred at Cross Creek Cemetery in Fayetteville. He was memorialized when a ship, present at the attack of Pearl Harbor, was named in his honor the USS Dobbin (AD-3). Richard Vaughn Spencer (born January 18, 1954) is an American politician and businessman who currently serves as the 76th United States Secretary of the Navy. Spencer served in the U.S. Marine Corps from 1976 to 1981 as a Marine Aviator and also served as Vice Chairman and Chief Financial Officer of Intercontinental Exchange from November 2001 to January 2008. Constructed at Bath Iron Works (BIW) in Bath, Maine, Paul Hamilton was commissioned in Charleston, South Carolina. The destroyer was transferred to Pearl Harbor, Hawaii after her commissioning. She is currently homeported in San Diego, California. USS Paul Ignatius (DDG-117) is an Arleigh Burke-class destroyer of the United States Navy. She is named for Paul Ignatius who served as United States Secretary of the Navy under President Lyndon Johnson from 1967 to 1969. Ignatius had previously served as a commissioned lieutenant in the Navy during World War II. Paul Ignatius is the 2nd of 8 planned Flight IIA "technology insertion" ships, which contains elements of the Flight III ships. She was launched on November 12, 2016, and was christened on 8 April 2017. William Birrell Franke (April 15, 1894 – June 30, 1979) was United States Secretary of the Navy from 1959 to 1961 under Dwight D. Eisenhower. Franke was born in Troy, New York and attended Pace College. William Henry Hunt (June 12, 1823 – February 27, 1884) was the United States Secretary of the Navy under President James Garfield and briefly under President Chester A. Arthur.